Darwin-SW (DSW) is an RDF vocabulary designed to complement the Biodiversity Information Standards (TDWG) Darwin Core Standard. A goal in the creation of DSW was to facilitate consistent markup of biodiversity data so that RDF graphs created by different providers could be easily merged. Accordingly, DSW provides a mechanism for testing whether its terms are being used in a manner consistent with its model. Two transitive object properties enable the creation of simple SPARQL queries that can be used to discover new information about linked resources whose metadata are generated by different providers. 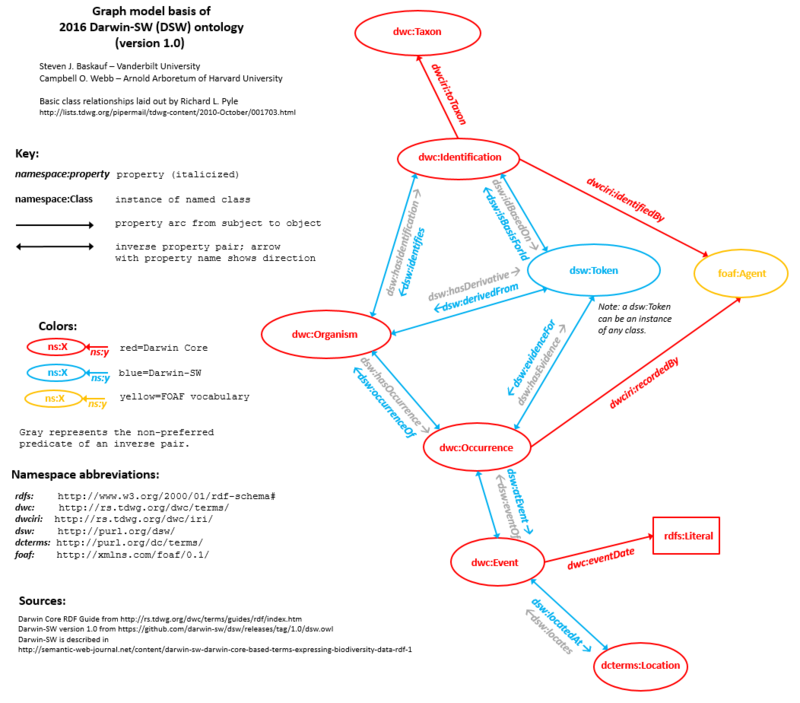 DSW is based on a model derived from a community discussion about the relationships among the main Darwin Core classes. DSW creates a new class to accommodate an important aspect of its model that is not currently part of Darwin Core: a class of Tokens, which are forms of evidence. DSW uses Web Ontology Language (OWL) to make assertions about the classes in its model and to define object properties that are used to link instances of those classes.